I made this for my reference, so that I could make sure that I'd be able to write all the points, in case a LAQ was asked about it. 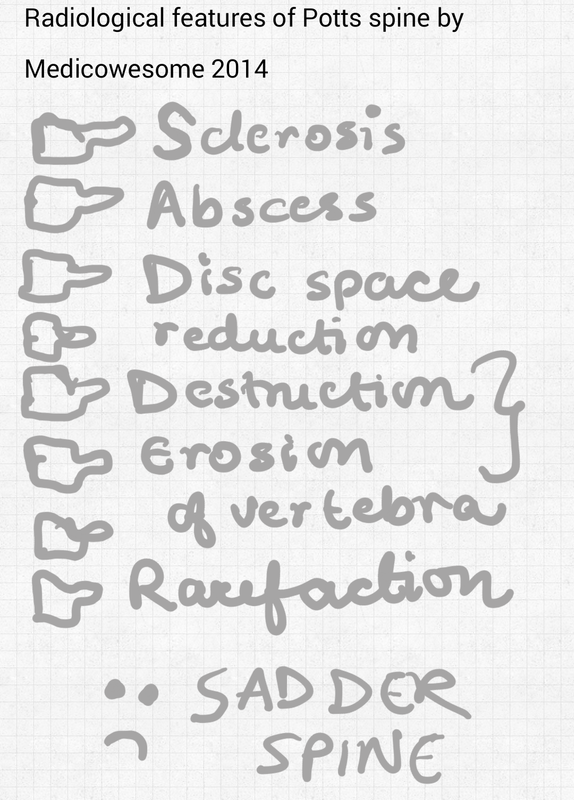 Radiological features of tuberculosis done mnemonic: SADDER spine. S for sclerosis. It is a sign of healing and is seen late in the disease. A for cold Abscess. Write about evidences of retropharyngeal, prevertebral, paravertebral, psoas abscess or simply a widened mediastinum seen on x-ray. D for disc space reduction. Early sign. D for destruction of the vertebral body causing wedging. So the clinical symptoms of TB spine are - Pain, stiffness, cold abscess, deformity, paraplegia.